If it resonates with you then it is right for you; whatever ‘it’ is. If you live a life based on this concept you become fulfilled, self realized, more confident, and limitless. This is the magical key to experiencing all that you could possibly wish for. This is the limitless path many are still searching for. Connected to SOURCE is a book of self reflection, self contemplation, inspirational deliverance, and a guide to the journey some call enlightenment. Everyone has her or his own belief and I believe everyone has his or her on truth. Guided by that inner voice that leads you by its inspirational vibe and creates embers of inner fires within your whole-self leads you to your own truth. I say your whole-self because after you follow that inner voice that leads you into all truths, your whole-self experiences the metamorphosis and you find yourself to be something more and beyond what you’d ever imagine in your earth years. Enjoy the read, I know I do daily. Good day and namaste. Writing is inspiring. I enjoy certain environments. Writing is simply a vehicle for which to experience the environments I enjoy. Quiet, tranquil, reflective, peaceful, contemplative, mature, grounding, intuitive, clear. I also enjoy the idea of getting who I am out to others that may know me but not know me in the way that I am able to express through my writings. Writing Connected to Source Renew Your Whole-Self is experiencing inspiration x2. 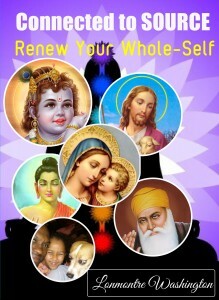 Connected to Source Renew Your Whole-Self is an inspirational book. A book to free the mind of self doubt and f.e.a.r. (False energy appearing riveting)..as I call it. You are I AM..You are what you need to be. I……….AM and there is..no duality…no separation…. Do not let the fear of the time it will take to accomplish something stand in the way of your doing it. The time will pass anyway; we might just as well put that passing time to the best possible use.